Wayne Wonder Based in Gloucestershire in the U.K is one of the country's leading children's entertainers and winner of multiple awards across his field. As a magician and children's entertainer I am constantly on the look out for new ideas, different takes on old ideas and practically anything I can add into my repertoire. As a by product of this I come across or invent lots of ideas that for one reason or another I can't fit into my shows. That doesn't mean that they are no good in fact many of them work great for ideas to try at home. I only realised this after having my daughter and seeing how much she enjoyed them. That's why I have created this resource, for families to visit take away what they want and try these things at home. You have everything at your fingertips for great, easy and inexpensive ideas for your little ones at home. Going out to new experiences and spending time together as a family is important if not crucial to a child's development but that doesn't mean you have to go out and spend lots of money every time, you can create amazing memories just by investing a little bit of time at home with these great ideas. 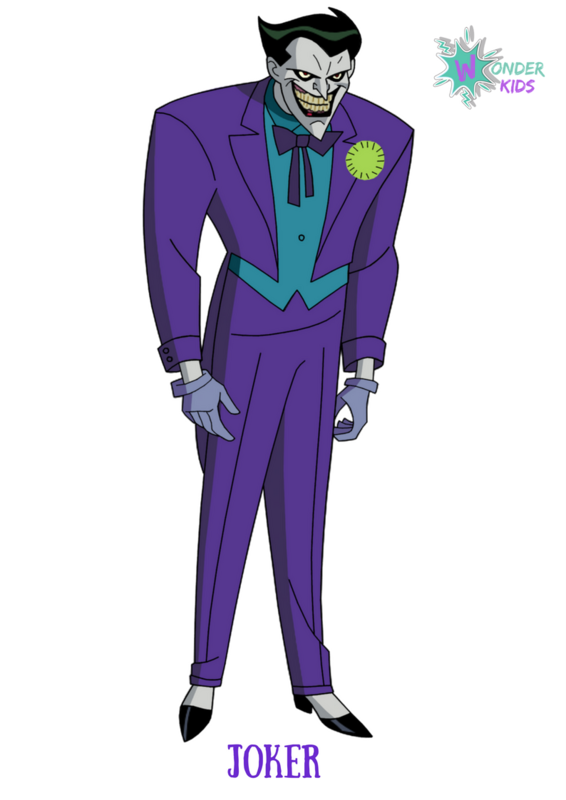 Welcome to May here at Wonder Kids, Summer is nearly here and we are really ramping up, not only will we have bumper posts every week this month whilst we explore how we can have fun with Batman and the Justice League. We will also be updating the Seasonal section of the site, ready for Summer and I have a brand new Re-Mix post to share, you can still check out the current one here. On top of all of this I will have dozens of new recipes for the Kids Kitchen, a top secret Magic Convention that I will be attending and writing about and A family trip to Disneyland Paris planned too. Of course I will be writing about that trip too. So this month is scheduled to be crazy! With lots of bookings in the diary too, I just received some prototype shoes from Nike, take a look in the video below. This first week I am going to show you some super fun games you can play with a Batman and the Justice League theme. I have already explored Marvel and the Avengers which you can take a look by just clicking on Hulk. This great game is super simple to put together, in fact I did something similar for the Minions. Empty some 1 or 2ltr drinks bottles, clean and dry them and then use spray paint to paint each one a different colour. The person that knocks the most pins over is the winner. Make it harder by adding sand/water into the pins so that they are harder to knock over. Little Superhero's will love this game, you hold a small board facing the ground and ask each child to hit the board as hard as they can. If they are able to break the board they win a prize. 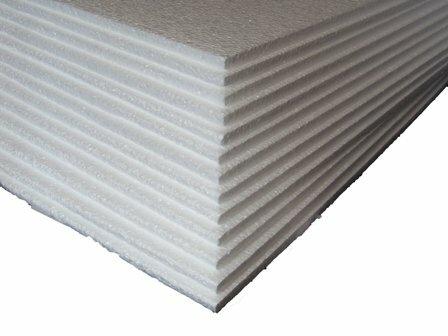 The boards used are very thin Polystyrine. To make it super simple I have included a link for some polystyrene boards below, just cut them into small planks and there is plenty of fun to be had. 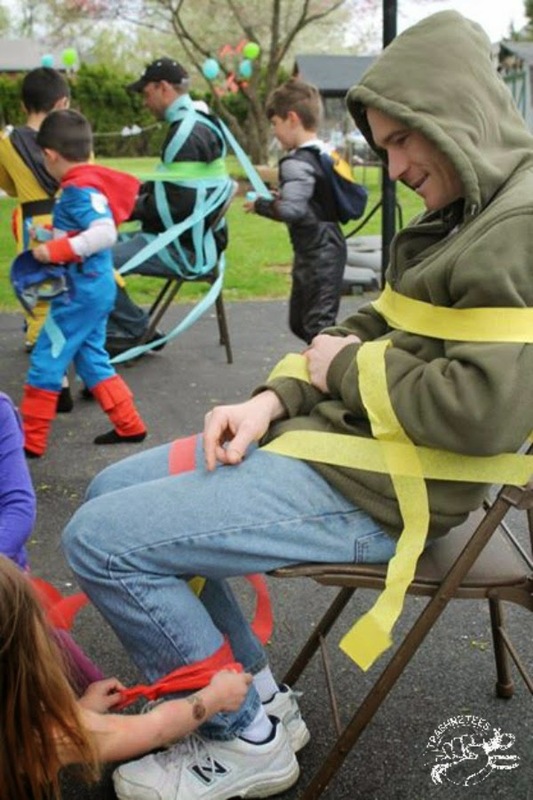 Here are a couple of quick ideas, How about trying to Tie up the Super Villain, use paper streamers or toilet roll and give the kids a time limit, the person that ties up their villain the best is the winner, Also how about Can you Unfreeze Batman? or any other superhero you have around. 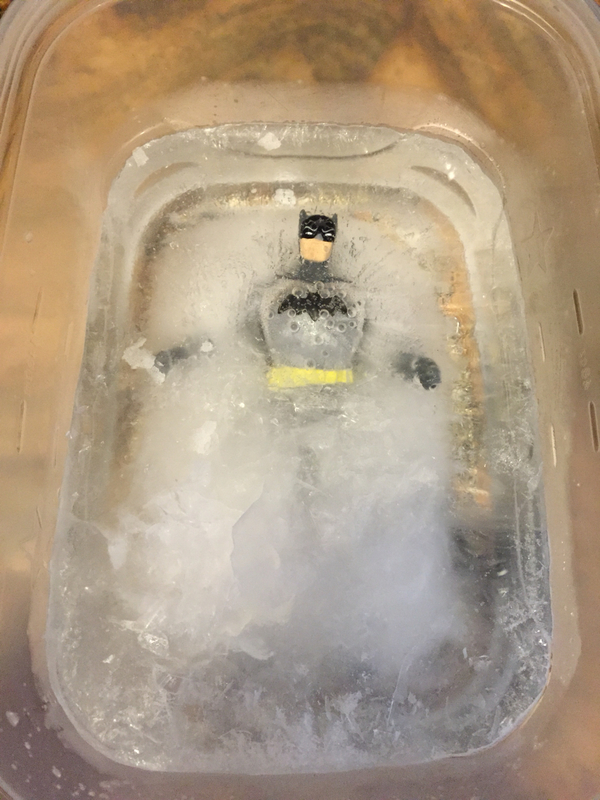 Use either a balloon or cake tin to encapsulate the superhero in ice. I find that at the very least they will need to be in the freezer overnight normally two to make them really solid. I have done this with my family many times with many different themes, I tried it with Dinosaurs using balloons, you can just have them squirt warm water at the ice or you can try giving them small toy hammers to bash at the ice or turn it into a little science experiment by showing them the affect salt has on ice. I love this idea, you'll need some silly string for the kids to shoot the villains. You can just get some cans and let the kids spray the villains or you can get these awesome silly string guns. I found these a while back and used them to finish my halloween shows, spraying all the kids with silly string. It was tons of fun but I think it would work brilliantly in this game. I have included a link to buy them to save you some time trying to find them. I have never found them in a store only online. In the UK you can buy them from Tesco online but again I have never seen them actually in store. You may be able to find them on eBay but I couldn't find any on Amazon. Now you need some targets. I have made below a bunch of super villains on A4 sheets of paper that you can print out. You can choose to mount these on a board like in the picture above or what I would like to do is hang them on a washing line with either cable ties or just pegs and the get the kids shoot them. If you have a rotating washing line you can spin the pictures a little and create a real challenge for the kids. Thats it for our first week of Batman and the Justice League but make sure you come back next Tuesday for even more great ideas. Conclusion to our series of fun Space Exploration for the kids, this post has all sorts of great Birthday Party space decorations ideas, cakes plus free birthday party invites and more. Sign Up and we'll send you FREE ideas every school holiday direct to your inbox. We respect your privacy and never share your details with any third parties.